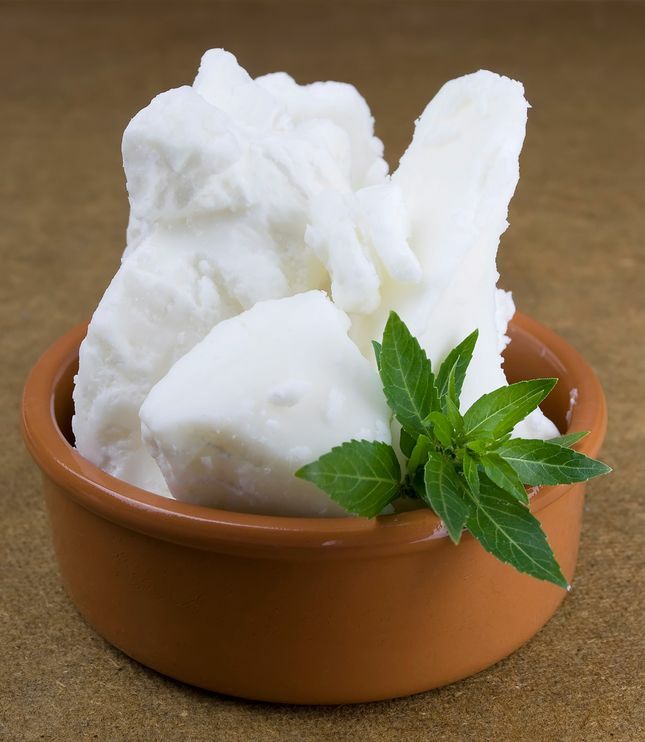 Shea butter is off-white, ivory-colored fatty substance. It is obtained from the nuts of the shea tree – also known as ‘Karite Tree’ and ‘Mangifolia’. This tree bears fruits. And, the nuts inside its fruits contain the shea butter. In West Africa, people have been using shea butter for hundreds of year. It is famous as a healing butter among them because of its healing properties. They crush it and boil it in order to extract light-colored, raw fat – shea butter. The raw shea butter has vitamins and minerals. It is loaded with vitamin A, vitamin E, and fatty acids. For that reason, it is often used in food preparations too. Even the chocolate industry relies on it. Different manufacturers use its properties as a substitute for cocoa butter. They mix it with different oils and substances to create their own special product. Our world is beginning to understand its true power too. Especially, the cosmetic industry has fallen in love with it. Since, the shea butter is so moisturizing and hydrating. When you apply the butter on the rough patches of skin, you feel instant smoothness. It has anti-inflammatory and anti-aging properties that provide breathtaking results. That’s why we often see this ingredient in moisturizers, lotions, and cosmetic products. The key components of shea butter are oleic acid, stearic acid, and linoleic acid. It is available in several forms in the market. But, the organic form is the purest one. It is natural and least processed. In organic form, shea butter retains its natural properties, which are essential for health and skin benefits. Some of the health benefits of shea butter are given below. Do you have wrinkles? ‘Shea Butter’ is the thing you should look for. It is very effective in lessening the facial lines. Wrinkles form because of dry skin and lack of active ingredients in your skincare regimen. But, the moisturizing properties of shea butter transform dry, cracked wrinkles into smooth, flawless skin. It doesn’t reduce the wrinkles, but also make your skin glow. It also nourishes your skin and keeps it healthy and clear. So, instead of using some anti-aging cream, you can count on shea butter. You will notice a major difference in your skin within three days. Brigitte Mars, author of ‘Beauty by Nature’, recommends shea butter for lips. According to her, it is a healing lip balm that keeps your lips moist. It protects them even in cold, dry weather. In case winter is right around the corner or you are exposed to dry air, shea lip balm is a long-lasting friend. If you have it, you don’t need any other lip-care product. Besides, you can create your own lip balm too. Add 2-3 drop of peppermint oil to a tablespoonful of shea butter. And, whip it. Apply it to your lips in small circles and leave it for 2 minutes. Next, wipe it gently with a damp towel. This balm won’t be in a solid form. But, it gives your lips a smooth look. Apply it only two times in a week. Shea butter properties also cure a wide range of skin conditions. If you have troubling disease like eczema, you can treat it with shea butter alone. In eczema, there is irritation and inflammation on the surface layers of the skin. Shea butter contains crucial ingredients like emollients, fatty acids, anti-oxidants and anti-inflammatory agents. All these powerful chemical components target the underlying pathological process that causes eczema. In other words, these components target the roots of eczema and banish it completely. Stretch marks are actually the scars that appear on different parts of your skin. These marks are often around stomach, thighs, breast, and hips. The main causes of stretch marks are rapid weight gain or obesity, pregnancy, weight lifting, and hormonal imbalance. Luckily shea butter has a great concentration of linoleic and oleic fatty acids. These two acids stimulate collagen products and reduce stretch marks. In order to have the best results, you can apply the combination of shea butter and some vitamin E oil. This rejuvenates the skin and keeps it hydrated too. Dermatologists say that prolonged exposure to sunlight causes all kinds of skin problems. Even a mild burn can destroy the top layer of your skin. Though, there are lots of sun protection tips, but nothing beats shea butter. It has vitamin E and vitamin A that help skin against sun damage. It has a natural sun-protecting factor too, which prevents your skin from over tanning. In addition, in case you are struggling with skin discoloration, this butter facilitates you in getting rid of skin discoloration as well. On the whole, it is a nature’s present. It is that versatile present which you can use daily to have a beautiful, perfect, glowing skin. You are in fact using it already, as it is a main ingredient in many cosmetic products. For lotions to lip balms and healing creams, it is everywhere. However, it isn’t in organic form. The refining process removes its beneficial properties. Therefore, it is better to get it in organic form if you want tangible results. So, believe the hype! If you are stuck on a deserted island, you should have at least one body care product – shea butter. It is your skin’s best friend. In fact, every home should have shea butter. It doesn’t matter whether it is an organic form or refined form. It will always benefit you & make you look naturally beautiful and glowing without even makeup. When shopping, prefer organic shea butter though. It won’t be so smooth or a creamy lotion. It will be more like a harder and greasier substance with a slightly smoky smell. But, it will soften when you’ll warm it. Its color ranges from creamy off-white to yellow. If you find a very white shea butter, it means it is very refined and has additives. Surprisingly, women are the actual producer of ‘Shea Butter’. The U.N. notes that shea butter production provides employment and income to millions of women in Africa. Its immense demand in the cosmetic industry makes it one of the most valuable products.